The toll lanes were forced upon the public with deception propaganda and straight out lies. We were promised 2 additional general purpose lanes in each direction on I 405 from Renton to Bellevue not extortion toll lanes. Leaving I405 with only 2 general purpose lanes in each direction is Wrong and just pain stupid. We already have a huge diversion problem and if these toll lanes are forced through it will create a traffic catastrophe sending thousands of cars cutting through our neighborhoods avoiding the tolls. We need general purpose lanes NOT Toll lanes. NO TOLL ON I405 from Renton to Bellevue! To Jeff Lykken. I can see your concern, however it seems like they aren’t taking away any general purpose lanes at all.....so traffic at the least won’t be any worse than it was. So it won’t force people to take back roads around if they weren’t already. In addition, it is letting the people in the HOV lane stay there to get on 405, where previously they were having to merge into and clog up the general purpose lanes. Therefore, by doing this it will have the same effect as building another general purpose lane because the HOV folks won’t be using the general purpose lanes anymore, or even slowing traffic by having to merge. Plus it is another incentive to carpool which is great. Makes sense all around. Thanks for the hard work WSDOT. I-405/SR 167 Interchange Direct Connector Project opens to traffic..
and seems to have great potential to reduce traffic and commute times. Why no add to Good-to-Go tolling section. I would still be free to HOV (2+ people) and return more revenue for the WSDOT. Currently, this expensive project is NOT being utilized proper. Thanks for completing early! The I-405/SR 167 Interchange Direct Connector is just the first phase of the larger, I-405 Renton to Bellevue Widening and Express Toll Lanes Project that will add express toll lanes on I-405 between SR 167 in Renton and Northeast Sixth Street in Bellevue. 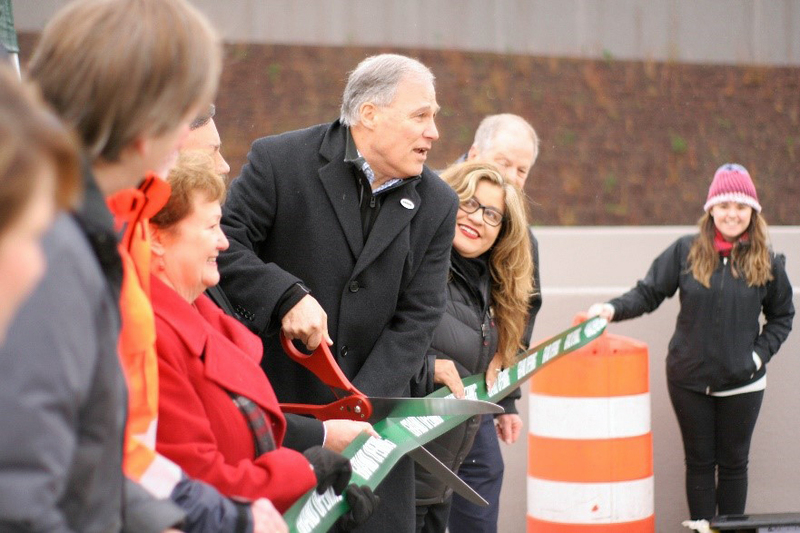 Once the Renton to Bellevue project is complete, the Direct Connector will link the SR 167 HOT Lanes to the I-405 Express Toll Lanes, creating a 40-mile system of managed lanes and solo drivers will have the option to use the ramp. The Renton to Bellevue project is scheduled to open to traffic in 2024. Less HOT lane paying drivers in genaral lanes totally makes sence!! We need traffic relief NOW!! Not in another year or too..
Why not let solo hot lane drivers use the new hov connections now? Then once on the old portion of the freeway they exit hov and enter the general purpose lane? Just another failed project, all that work for two under utilized HOV lanes, that does nothing to address actual congestion and traffic. Remember the goal is to force you out of your car use public transportation while living in high-rise apartments your entire life - fixing traffic congestion is a pipe dream at this point --- Why do you think Boeing moved it headquarters elsewhere and Amazon plans to move out of the once beautiful Emerald City.